Every hair follicle has melanocytes which are hair colour producing cells. With age, the melanocytes slowly stop producing the melanin, thus making the hair strands turn gray and then white. But due to some factors, melanocytes might stop producing melanin before time. This is then termed as premature graying of hair. • Frequent use of hair chemicals & dyes. Hair graying is medically termed as canities. It is a process of chronological aging and occurs regardless of gender or race. The colour of human hair depends on melanognesis, the process of synthesis of melanin and its subsequent distribution from melanocyte to keratinocyte and this is thought to be regulated genetically. Premature graying may appear alone without underlying pathology or may occur in association with certain disorders like thyroid dysfunction, anaemia, stress, illness. Reversible hypo pigmentation of hair has also been noted in association with nutritional deficiencies like chronic protein loss, kidney dysfunction, intestinal diseases, iron deficiency & copper deficiency. Insufficient neuroendocrine stimulation of hair follicle melanogenesis may be the possible mechanism for hair graying. Smoking is reported to be significantly correlated with hair graying and impairment of stem cell regenerative capacity. The hair follicle pigmentary unit is maximally functioning during post adolescence and early adulthood. In contrast to aging of our skin, premature graying may not be hastened by cumulative photo damage. The rate at which an individual turns gray depends on genetics. In men, graying usually begins at the temples and in the side burns. Later, it spreads to the vertex and the remainder of scalp, affecting the occiput last. Women usually start graying around the perimeter of hair line. Graying of hair is usually progressive and permanent but there are reports of spontaneous pigmentation of graying hair and spontaneous reversal of canities may occur during the early stage. Gray hair undergo more severe UV damage and need more UV protection than dark brown hair. Gray hair often fail to hold a temporary or permanent colour and is more resistant to incorporate artificial color due to changes in the underlying substructure of the hair fiber. Diagnosis of canities i.e. premature graying of hair is primarily clinical. Certain investigations such as serum vitamin B12, folic acid and thyroid profile may be conducted in individuals with early onset, in absence of any family history. There is wide scope for reversal of premature graying of hair. It emphasises on treatment with herbs and strict dietary habits and lifestyle along with yoga and pranayama. Following herbs are beneficial in dealing with this condition either by dying the silver hair or promoting the melanocytes function which are responsible for giving color to hair. This plant is best known for its hair benefits. The active ingredients present in this herb help the dormant hair follicle to come out of their sleeping stage and thus promote hair growth. Bhringraj oil helps in maintaining the natural colour of hair. The oil also helps to boost blood circulation to the scalp. It is also called Indian ginseng and is abundant in anti oxidant, anti inflammatory, immune boosting and anti stress properties. It is known for promoting the production of hair melanin. It is very useful in hormone induced hair loss. It can be consumed internally along with amla powder and honey. Amla serves as beneficial tonic in graying of hair. The phytonutrients, vitamins and minerals present in amla help in stimulating healthy hair growth. Vitamin C of amla produces collagen protein that helps to replace the dead cells of hair follicles with new hair cells. It also serves as a natural hair conditioner. Coconut oil goes deep into the scalp and binds the proteins of hair. It strengthens the hair fibre content and thus helpful in gray hair. It is rich in zinc, selenium, vit B3, B6, copper and iron which are essential for maintaining normal colour to hair. It is extremely important water soluble vitamin for healthy growth of hair follicles. It helps in proper blood circulation, promoting cell repair and increasing immunity of the body. An insufficient quantity of vit B6 results in decreased amount of melanin which causes early onset of gray hair. Bananas, potatoes, spinach, bell peppers. This vitamin helps strengthening and conditioning the hair. It maintains steady supply of pigments responsible for hair colour. Deficiency of vit B12 results in graying of hair. Folic acid helps to keep red blood cell count at a normal level keeping the hair healthy. Deficiency of this vitamin can lead to pigmentation changes in hair. Leafy green vegetables, citrus fruits, legumes, cereals, rice, asparagus, beets, nuts, seeds. It is an essential part of a healthy diet. This vitamin contributes to the nourishment of hair, helping them to function properly. It can also help relieve skin itching and dandruff. Deficiency of this vitamin results in hair graying and fall. When the food is processed, a large amount of its pantothenic acid is lost. A powerful antioxidant which breaks H2O2 molecule into harmless oxygen and water. It is reduced when there is stress or poor diet. This causes build up of H2O2 in hair follicles turning them white. Almonds, wheat grass, garlic, onion, cabbage & turnip. It is a cofactor to the enzymes need to produce the hair pigment. Gray, white and silver hair is a symptom of copper deficiency. Oysters, whole grain, dark green leafy vegetables, cocoa, black pepper, almonds, lentils, mushrooms, guavas. 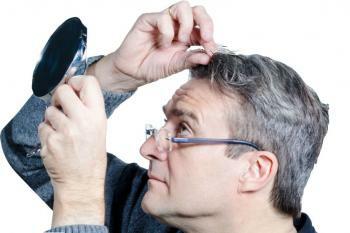 Premature hair graying is a bothersome condition. If the factors responsible for causing this condition are being kept in mind and balanced diet is taken with stress free life, the conditions can be reversed. Use of herbs and vitamins supplements give wonderful result. Premature graying of hair has significant adverse effects on the appearance & self esteem of an affected individual. Studies have raised the possibility that long term use of synthetic hair dyes may be associated with an increased risk of developing skin cancers, contact allergic reactions and hair loss. Hair require a mixture of both vitamins and minerals to grow and Vit B12 is one of the essential vitamins.Its deficiency impacts hair quality. Folic acid is naturally found in food in the form of folate. In fortified food & supplements, it is present as folic acid.